For the eighth time in 33 years, faithful Zanies headed to Arizona. Our second convention had been held in Payson, in 1984; in 1986, we met in Flagstaff; in 1988, Page; we returned to Payson in 1995; it was Prescott, in 2008; we returned to Payson for the third time in 2007; two years later, we met at Mormon Lake; and now, in 2015, faithful Zanies returned to Mormon Lake for the second time. Prior to the convention, Connie and I and Lucy and Bob Earp joined a large group of others for a visit to Kohl’s Ranch at Christopher Creek. Sunday afternoon, we caravanned up the slope of the Mogollon Rim to the site where Grey’s cabin once stood before the Dude Fire of 1990 erased it from the map. For me, it was so poignant to revisit a spot I have loved for so long. I first came here in the early 1970s, and returned again and again. Once I spent most of a week here; like Zane Grey himself, at night I’d spread out my bedding and sleep out under the stars, listening to the soughing of the pines. In those days, pilgrims came here from all over the world. I’d see them sitting on the veranda, a far-off look in their eyes as they gazed at range after range of mountains. And how could I forget college coeds, leaning against trees, lost in reading Grey’s timeless Mogollon Rim romances, Under the Tonto Rim and Code of the West. And there in the Cabin, holding court, the inimitable curator, Margaret Sell, to whom the place represented life itself. Then it was back down the vast mesa to Kohl’s Ranch, loading up the Honda Pilot, and heading up on the mesa to Mormon Lake, there to be greeted by the gathering clan. Of all the places where we’ve met over the years, the Mormon Lake ranch is the most rustic, only the West Texas convention facilities at Fort Davis coming close. But it was its very rusticness [is there such a word?] that so many of us enjoyed so much. A phenomenon that never ceases to amaze me is the sight of the returning faithful—many (usually a third to half the attendees) arrive days early, so eager are they to get together again. And so it proved to be once more. In the evening, it was time for our opening banquet in the ranch’s so-called “Steakhouse.” Not formal like most banquets, but western attire the norm. In no time at all, the decibel level, caused by old friends finding each other and catching up on each other’s lives, got louder and louder—not to recede until Friday morning. The food, provided by Scott Gold’s FOREVER Resorts team, was splendid. Then it was time to head for the cabins and RVs. Tomorrow would be the biggest day of the convention. Not until Tuesday morning is over do I ever get to relax at our conventions. Reason being that I put more work and thought into the annual Keynote Address than I do any other speaking engagement. And, naturally, I don’t dare ever resort to anything that is stale or a re-run. Beginning in June of 1983, until now, in a very real way, I have measured my life by Keynotes. Now, here I was with my 33rd consecutive Keynote Address. I titled it, “Light of Western Stars — Why It Stands the Test of Time.” I chose this book for my Keynote because 2014 was the 100th anniversary of this, one of Grey’s greatest books. Also, it has always been one of my personal favorite reads. Those of you belonging to the Zane Grey’s West Society will be getting the full text of the Keynote in your next issue of our magazine, The Zane Grey Review. I was followed by three fascinating presentations: Harvey Leake’s “From Kayente to Rainbow Bridge: The Rugged Route that Inspired Zane Grey’s Geography of The Rainbow Trail.” Leake is a direct descendant of John and Louisa Wetherill, famed Traders to the Navajos in Monument Valley and who had much to do with the discovery of Mesa Verde and Rainbow Bridge. We always look forward to his behind-the-scenes personalized history of the region. Next came Dr. James D’Arc’s “BYU Happenings.” D’Arc is head curator of Brigham Young University’s film archives and has had a big role to play in the acquisition of major Zane Grey collections (including my own) and films in recent years. BYU is now the largest repository of Zane Grey archival holdings in the world. Reason being that Zane Grey’s books did more to bring fame to the American Southwest (especially Arizona, Utah, Colorado, and New Mexico) than any other writer who ever lived. D’Arc was followed by Dr. Alan Pratt’s “Appalling Beauty, Dangerous Crossing: Zane Grey at Lee’s Ferry.” Pratt, like Mr. Leake, has become a regular in terms of his visual explorations of Zane Grey book and travel settings. Pratt pointed out that back before the Colorado was dammed, during spring flood periods, the silt-laden river ran so fast that if you fell in while trying to cross it, inevitably you’d be swept away to your death. I will complete the story of the 33rd convention in next week’s blog. 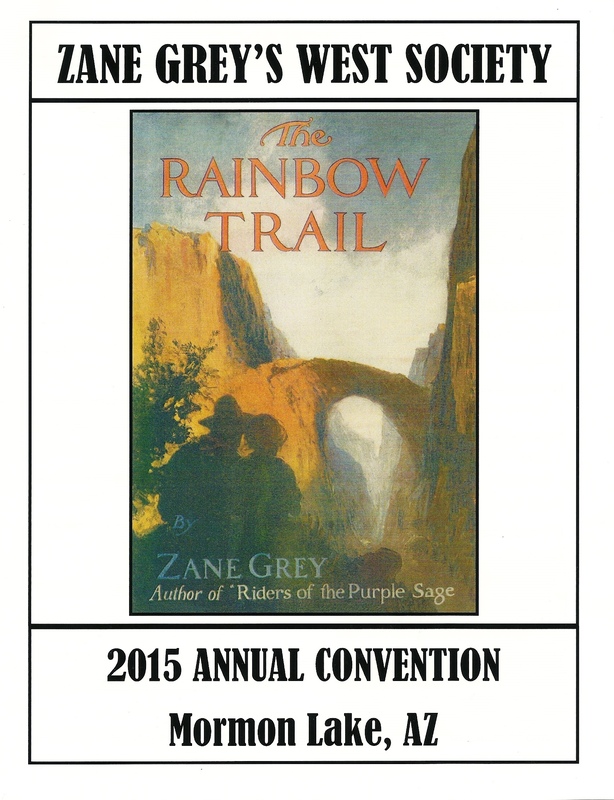 If you haven’t yet joined the Zane Grey’s West Society, I urge you to do so! You will learn so much about—not just Zane Grey (the Father of the Romantic West)—but also this incredibly fascinating West tourists come from all around the world to see. and tell her I invited you to join our extended family. Also you can check out our Society’s website at: http://www.zgws.org.